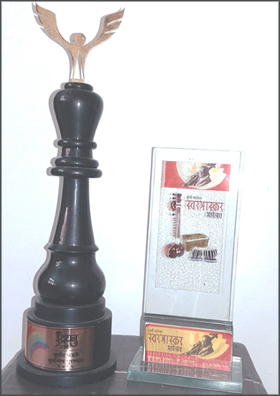 "Surashree Puraskar" given by Lalit Kala Prabodhini in April 2017. Surashree Foundation's SWARBHASKAR PURASKAR 2016 [Awarded in memory of Late Pandit Bhimsen Joshi]. SUDHIR PHADAKE YUVONMESH PURASKAR 2015. The Akhil Bharatiya Gandharva Mahavidyalaya Mandal has declared nine awards to Rewa for scoring highest marks in the Sangeetacharya Exam. Gayanacharya Pandit Vishnu Digambar Paluskar Award, Late Vinayakrao Patwardhan Award, Late Yashvantrao Mirashi Award and six more awards will be conferred on her at the Convocation Ceremony on June 8, 2014 at Kolhapur. Rewa has received first prize at various music competitions such as the ones organized by the Gadharva Mahavidyalaya, Pune (1986), Rotary Club, Pune (1991), Dadar Matunga Cultural Centre (1993). Rewa stood first in the national level competition of the All India Radio and thus received the National Scholarship for Classical Music. Received Tamhankar Scholarship from Gaanvardhan, Pune (1994). Rewa won the first prize in the Discovery of India Contest held by Nehru Centre in May, 1998. Rewa received the prestigious Late Pandit Trimbakrao Janorikar Award for Music in the year 2004. Recipient of the “Lalkar Puraskar” for the year 2011. Appreciation by Former Prime Minister Hon. Late Shri. P.V. Narsimha Rao was more than an award.